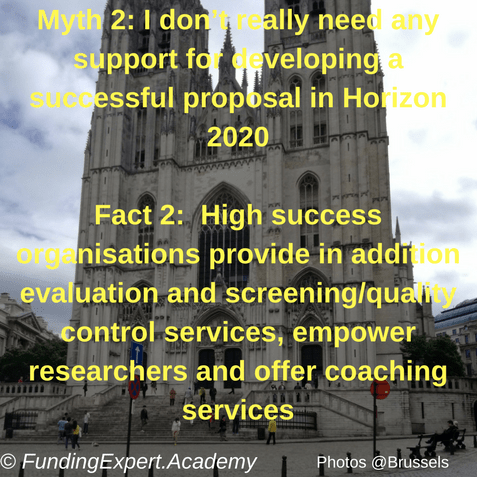 Here are the 5 myths and 5 facts instead about Horizon 2020 that every researcher must know. They are an eye opener. For more details watch the video below. 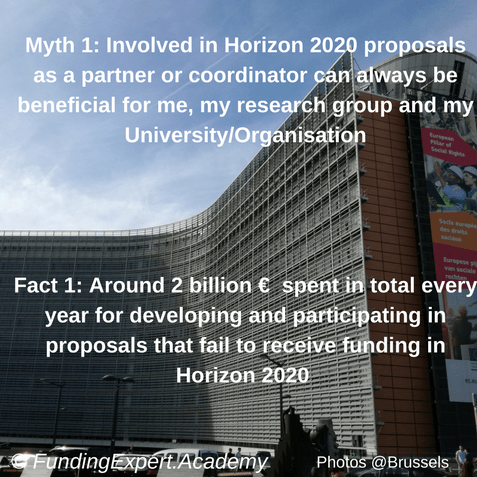 Fact 1: Amount(€) organisations spent in total every year for developing and participating in proposals that fail to receive funding in Horizon 2020 is around 2 billion EUR. This means that there is big need for effective screening, training, coaching and support! Fact 2: Low success organisations provide as support to researchers standard services such as eligibility and financial checks, support in submission. Average success organisations provide in addition training, sample sections/proposals and support in consortium building. However, high success organisations provide in addition evaluation and screening/quality control services, empowering researchers and coaching services. 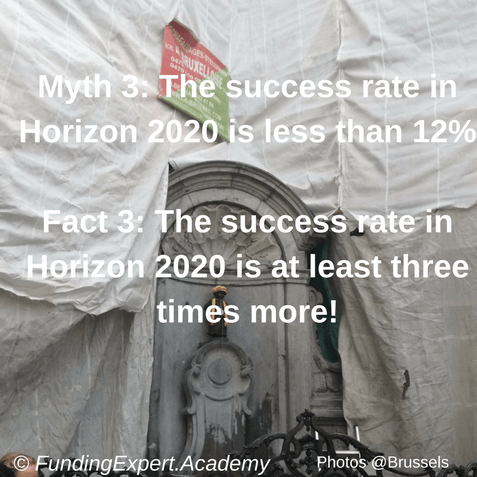 Fact 3: The success rate in Horizon 2020 is at least three times more! 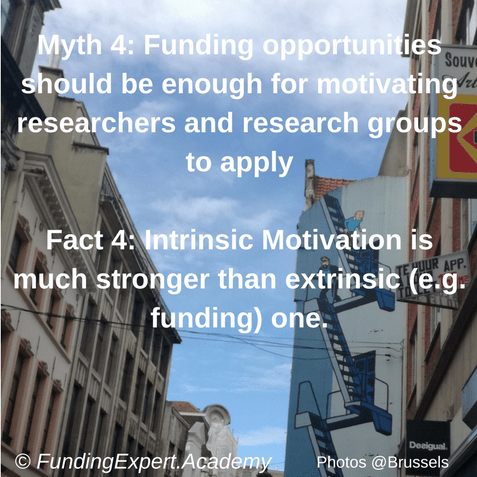 Fact 4: Intrinsic Motivation (reputation, status, contribution to your organisation and its community, contribution to society and to humans, serve a common purpose, etc( is much stronger than extrinsic (e.g. funding) one. 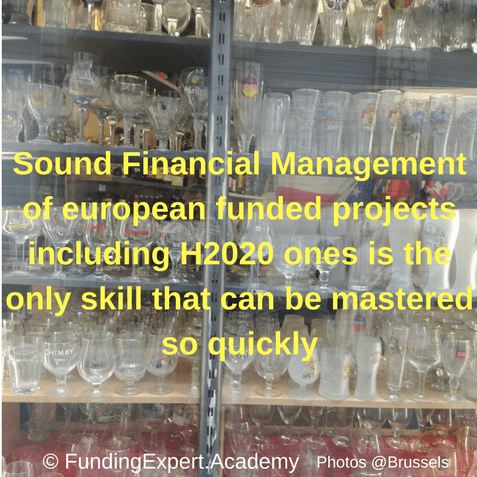 Myth 5: Success in Horizon 2020 is a cumbersome and complex challenge that few know how to deal with. Fact 5: One of the most successful Horizon 2020 proposal developers now used to be a massage therapist before coaching him. Watch the short video that I explain in more detail the above. You should not miss it also because it has many funny incidents (e.g. me falling along with the camera and a dog barks and almost bites me while I am shooting the video. What is your view on the 5 myths? Do you have other myths that you would like to share? Please comment below on your experiences. Finally, I provide below the 5 myths and facts on background photos that I have taken from Brussels where I produced this video above. Feel free to share them.